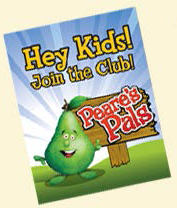 Once you've joined, we'll do our best to give you extra bonuses and rewards. 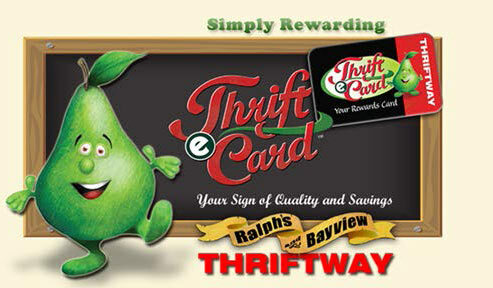 ThrifteCard  is always thinking of unique ways to thank you and the more you visit, the more rewarding your experience! Look for these tags throughout the stores to get rewarded on items you buy everyday. The rewards accumulate in your eWallet tied to your ThrifteCard and can be used next time you are at the checkout. Get rewarded at Bayview Thriftway's Dancing Goats Coffee Bar. Buy 10 drinks* and get $4 back in your ThrifteCard wallet when you use your ThrifteCard. 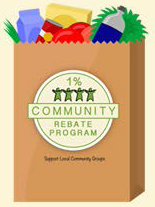 Shop and give back to your community at the same time. Pick from a list of participating non-profit organizations to have 1% of your purchases be donated to. To sign up for this program please call our Corporate office at (360) 596-0110. Earn 55¢ for every $10 spend every Wednesday! * Discount excludes money orders, lottery, gift cards, Service Center Services, Pharmacy. FREE Birthday ice cream - Events & Fun! *You may opt out at any time. We want to exceed your expectations giving you the best possible shopping experience by providing you customized information, valuable offers, and REWARDS! **Your right to privacy and your safety is our main concern. Your personal information will not be released to anyone ever.